The students of Obafemi Awolowo University have beaten the President of the student union black and blue. The angry students were unhappy over the purchase of a bus worth N2.5 million by the Students Union. Trouble had been brewing since the union acquired the bus under controversial circumstances. The bus was to be used as a commercial transport shuttle around the university. Claims by the union’s Financial Secretary, Omisakin Kehinde, that the bus was purchased for N2.9 million did not tally with the actual value of N2.5 million written on the receipt. The union had to change their narration on the purchase upon the discovery, accepting that it paid only N2.5 million for the bus. 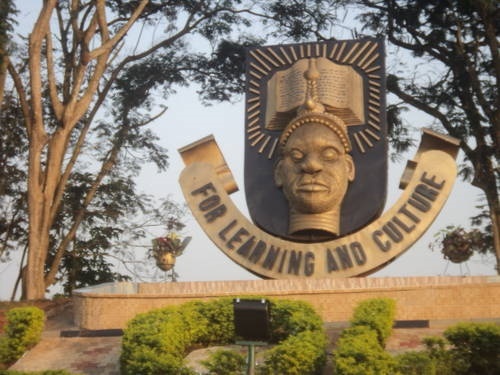 The President of the union, Oyekan Ibukun, called a congress on Thursday, following the demand of students asking to be addressed on the issues. He was however ruffled when it was demanded that he step aside from presiding over the congress in view of the allegations against his leadership. Ibukun rebuffed the move, resulting in a fight among the students. The students fought in different locations within the campus, while Ibukun was beaten up with his clothes torn in shreds. The wild fight could not be curtailed by the university’s security team, as they watched helplessly the parade of the union president by students who accused him of fraud in the bus purchase.